In 2019, a fantastic customer experience is arguably the biggest factor driving business growth. But if that’s the case, outdated, clunky, technology tools and solutions are one of the greatest hindrances. Particularly when considering digital banking security. Fortunately, innovative and engaging digital banking experiences that also deliver cutting-edge security are within reach. This month, we launched a new partnership with Entersekt, an innovator in mobile-first fintech solutions, to provide one-stop-shop continuous authentication, multi-factor authentication (MFA), and device validation. Now, financial institutions can offer enhanced security and usability across the customer life cycle. Here’s how. For years, banks and payment providers have encouraged users to adopt online banking solutions. Many have, but concerns around digital banking security linger, particularly on mobile. Banks need to provide ever-more innovative offerings to beat out competitors. It’s time to go beyond simply offering services to deepening engagement and fostering customer loyalty, much like popular consumer apps do. People love Apple, PayPal, Square, and others for a reason. Their user experiences are simple, streamlined, personalized, and fun. Banks and other financial services providers are exploring new mobile- and online-only experiences that can match the draw of popular players in the digital space. Financial providers, however, face heavy regulatory scrutiny, whether PSD2, GDPR, or PCI DSS standards. Ensuring the security of data and payments goes hand in hand with the user experience. Both are essential for maintaining brand reputation, customer trust, and growing revenue. Our collaboration with Entersekt goes one step farther, using security to enhance the user experience by generating innovative new use cases, such as passwordless login and enhanced remote user registration, so users can go about their business uninterrupted. Entersekt’s technology uses public-key infrastructure to uniquely identify any consumer device through digital certificates, transforming a device into a trusted factor of possession. When a user logs in to their bank account, for example, BioCatch automatically begins to collect and analyze behavioral parameters of the user’s interaction with their device. Based on factors such as how a user types, how quickly they enter information, or how much pressure they use when tapping through an app, behavioral biometrics technology confirms whether the user is legitimate or a fraudster. BioCatch then develops a risk score that is sent to Entersekt’s security platform. 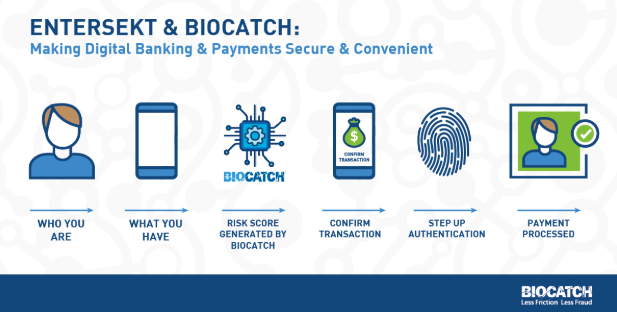 If BioCatch identifies low confidence in a transaction, step-up authentication or a push notification is initiated by Entersekt, meeting multi-factor authentication standards that are often mandated by law, such as under PSD2 in Europe. Finally, if the transaction is flagged for high fraud risk, it will be blocked completely. As a result, banks can prevent social engineering, account takeover attempts, malware, bots, and synthetic identity theft all while preventing unnecessary escalations that are frustrating to users. The world of banking and payments is full of potential as technology makes all manner of new opportunities available. Financial institutions that embrace the trend and put the customer first will be one step ahead. Enriching the digital banking experience with modern security authentication tools is an important step in the digital transformation journey. Learn more about BioCatch’s approach to authentication and fraud prevention for the financial services industry.